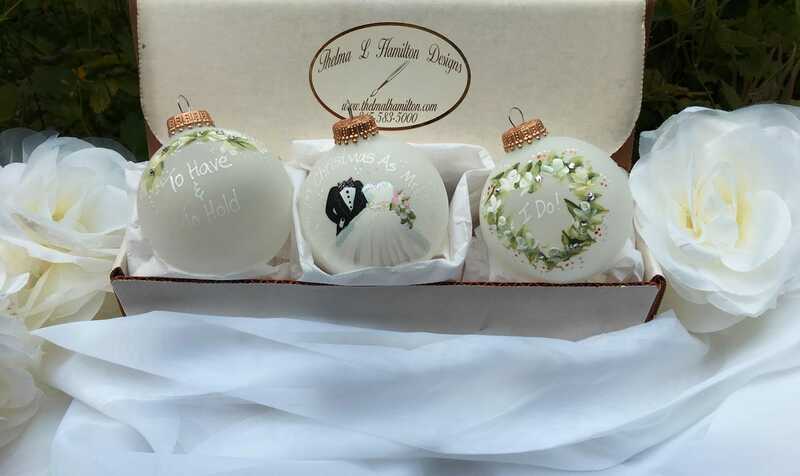 A set of three 2 5/8 inch, wedding ornaments, lovingly hand painted on frosted glass. Embellished with genuine Swaroski crystals, and packaged in a unique, white trio box. These keepsakes will become family heirlooms to be treasured for years to come! The ornaments look great and I am sure the bride will love them. Also it took less than a week to receive my ornaments from the time I placed the order till they showed up at my doorstep. I also love the way the ornaments are packaged. Very expensive looking! I will definitely order again and recommend to my family and friends. Beautifully done - they were a Christmas gift and my friend LOVED them! Thank you! I do not give refunds due to the fact that my ornaments are personalized. However, if there is a problem with the personalization, due to an error on my part (I check and double check everything that leaves my studio but mistakes do happen) I will certainly make it right. I usually ship USPS, unless you need it shipped another method. Since my product, Ornaments, are time sensitive, I ship every day. I will do everything in my power to get it there asap. If you need it by a certain date, please advise me of that date when ordering. I sell wholesale for qualifying orders of 6 or more of the same design, with orders totaling more than $150. I do custom orders and am happy to discuss your needs or desires. Personalized ornament celebrating your First Christmas together.